I've been watching this technology closely. 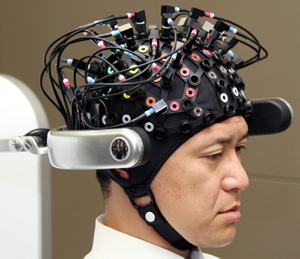 The 'brain wave' control mechanism has had a lot of powerful news coming out lately. I haven't seen any video of this one in particular, but it looks certainly impressive as it's imitating limb movement, and not just the (easier) facial expressions and movements. The environment presented here also makes me wonder about the 'training' necessary for the device. From what I've heard, it takes a lot of practice on the part of the human, and a lot of adjustment on the part of the machine to ever accurately mimic a thought. "Honda said the technology was not ready for general use because of potential distractions in the person's thinking. Another problem is that brain patterns differ greatly between individuals, and so for the technology to work brain activity must first be analysed for up to three hours." This is so very intriguing! I am completely fascinated with this technology and how it may apply to virtual avatars. This is the first time I�ve seen it applied to a real robot. Thanks for posting. Flommytherobot would like to point out that the idea of controlling a robot with human thought could be greatly accelerated by a close study of how a human woman controls a human man with thought. 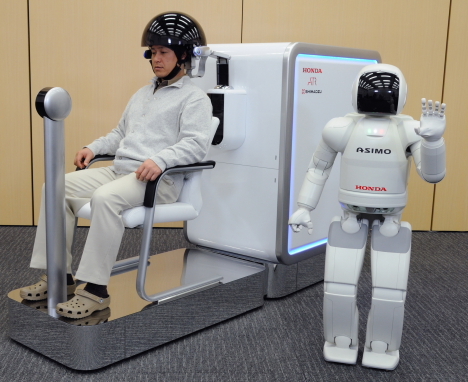 One configuration would be, upon the human subject being shown a picture of a cat, that Asimo cracks a whip, very loudly! Flommytherobot is pleased to have been of assistance. Yeah that's a really interesting brain-computer interface. Check out my neurotechnology blog too. I try to discuss weird stuff like that from time to time. Honda, Shimadzu and other japanese companies have always been aggressive in technology innovation. their robots are globally acclaimed for impressive ideas. Now this one is really amazing, But would i ever be able to see it. Think about reverse engineering? Ut oh! 'Surrogates' wherer people live through robots and people always safe. is this news is true???????????????? This could be very innovative...and i would like to see this except like battlebots and UFC combined where two robots fight to the death through the thoughts of their controlling humans...very intertaining..and yet....very expensive...and yet i feel like it could have the highest TV ratings since American Idol...who wouldnt wanna see a robot take on another robot with a Buzzsaw?